These women belong to the vast majority (94%) of the Indian working population that is "informally" employed: they don't enjoy the benefits and legal protection of a traditional employer-employee relationship. These particular women are piece-rate garment workers. They are paid per item of clothing they make, and earn only 4 to 5 rupees (less than one dollar) a day. The Self-Employed Women's Association (SEWA) helps these women organize into cooperatives and trade unions so that, together, they can improve the conditions under which they work and live. After eighteen SEWA members took part in training workshops led by Communication for Change, participatory video became a new tool for organizing. Through its productions, Video SEWA shows women the power that is generated by collective action, raising their spirits and giving them a sense of confidence and unity. The videos of public processions are among the organization's most often-used and powerful. ...When they reach the market, the marchers gather around a small woman with a megaphone. Her voice is lilting but stern as she leads the others in call-and-response chants: "We are workers! "; "Yes we are! "; Then she reads their demands - a rise in the piece rate, benefits, a minimum wage. Quick applause greets each item. The women are intent, their smiles confident. SEWA's videos aren't confined in reach to the local community. Renana Jhabvala, a senior SEWA organizer, explains: "We took this tape of the garment workers' procession to Lucknow, where we are organizing the women who do chikan embroidery. They are the worst paid that I have seen anywhere...We did some training with them and talked about organizing. On the last day we showed this tape and they were so excited and jumped up to plan out the route for their own procession." The women in Lucknow were separated from the women they saw in the videotape by religion, geography, ethnicity, language, and caste. They couldn't read the signs held by the marchers on screen. Nevertheless, the most important messages of the video came through clearly. The viewers in Lucknow saw that women could unite. They saw that the police respected their right to march peacefully. 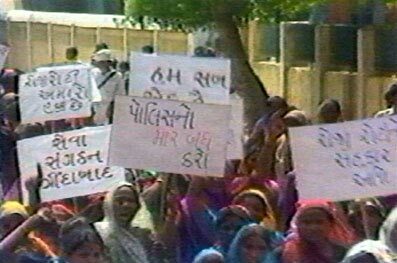 They understood that they faced the very same issues that had spurred the women in Ahmedabad to mobilize. Most importantly, they witnessed the strength of collective action. Says Jhabvala, "When women actually see that others like them have succeeded through organizing, it makes a big difference." Watch a tape about their work or visit Video SEWA.